Orem Vacuum and Sewing - Central Vacuum and Sewing Products are all homes in Orem, Utah and surrounding cities. Whatever you're looking for, we have the right central vacuum for your home. When you want the best, we can give you the best. The Silent Master Central Vacuum system is the top-of-the-line central vacuum unit on the market today. While maintaining its unique quietness, the SilentMaster vacuum will surpass any other central vacuum unit. 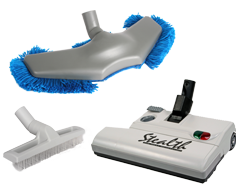 Perfect for any home and any cleaning needs, we know that you will never go back to any other type of vacuum. Want more information on the SilentMaster Central Vacuum? Call us today! Accessories are the backbone to any central vacuum system. That is why we offer a variety of cleaning products perfect for any cleaning situtaion. From Manta Mops that claen your hardwood floors, to perky groomers than clean thick shag carpets; we have it all. We also recommend the Stealth Attachment kit to our customers. With a belt that never breaks, you'll never need to buy another vacuum head again. If you are interested in purchasing central vacuum accessories, contact us today. Whether you are having a new home built or you already own an existing home, we can install a brand new central vacuum for you. We specialize in new construction and existing home installations, so you know you are getting the best work and vacuum tools. A typical installation usually takes one (1) day to complete, depending on the size of the home. At max, in existing homes, it can take up to two (2) days. If your central vacuum system has stopped running for any reason, we can service it for you. No matter what brand you own or what year you purchased the central vacuum cleaner, we have the experience and expertise you need to get it fixed. We will go out to your home and service the unit there. A service charge will apply. Contact us today for more information.